Representative Avery Bourne (R-Raymond) sponsored legislation to create a Youth Trapping License in an effort to promote trapping statewide. The bill, SB2410, passed the Illinois House and Senate unanimously and was signed into law by Governor Bruce Rauner on Monday. Effective January 1, 2017, the new law allows residents 18 years old and younger to legally trap in the state. With this Youth Trapping License, the holder must trap under the close supervision of a parent, grandparent, or guardian who is 21 or older and has a valid Illinois trapping license. The young person simply applies to the Department of Natural Resources and submits a $7 fee to obtain their license. Trapping plays an important role in the ecology and conservation in Illinois by helping to manage wildlife populations at healthy levels. Raccoon, coyote, red fox, gray fox, opossum, river otter, and striped skunk can be hunted legally within the state. Seasons vary by species and, in some cases, by zone. 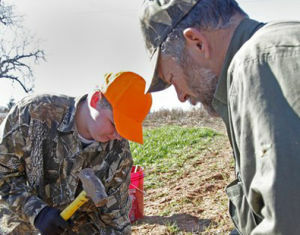 Check the Digest of Hunting and Trapping Regulations for details at www.dnr.illinois.gov.